EconomicsWisconsin is offering EconChallenge ONLINE! EconomicsWisconsin’s State EconChallenge is now online! No more needing transportation, permission slips or taking your students out of school. Be part of the competition right in your classroom! ALL TEAMS MUST BE REGISTERED ONLINE BY March 24, 2019! Log back in and create your team(s) of 4 students in the appropriate division (competing with 3 team members is acceptable, if necessary). Download unique access codes for each of your team members. Each access code must be used by the student for whom it was created. Have each team member visit the National Economics Challenge portal, click on “Student Access,” and complete the information requested. Rules, practice tests, and more information on preparing for the competition can be found on the CEE Website. 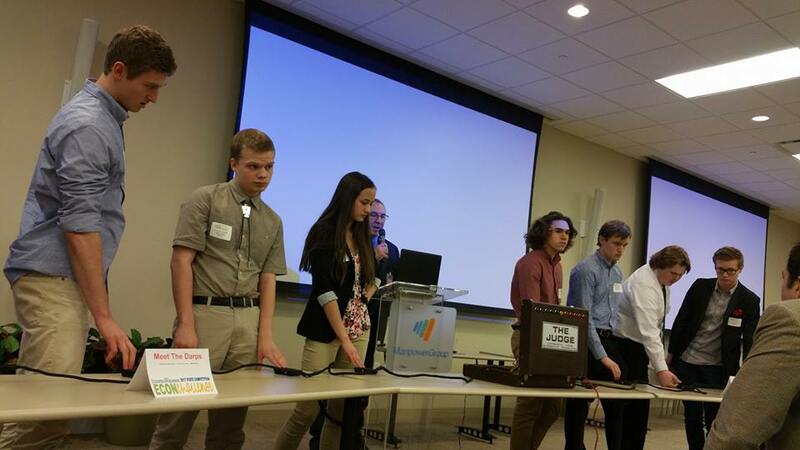 Every year the EconomicsWisconsin (Wisconsin Council on Economic Education), with support from the National Council on Economic Education, hosts the Economics Challenge Program. The Challenge is an opportunity for students to demonstrate their knowledge of Economic Literacy by competing with other students across the state in written and “Quiz Bowl” examinations. Students and teachers in Wisconsin begin the challenge by participating in a preliminary first round of the Challenge online. Teachers and Students throughout the State will be able to participate regardless of travel or budgetary constraints. In the first round each team of three to four students in two divisions will complete online exams that cover topics in macro, micro and international economics. The top high school team in each division in the spring competition will be invited to participate in the National semi-finals. All high school students are eligible. No formal courses in economics are required. Any team of students interested in economics is encouraged to compete. Schools may enter multiple teams in their qualifying divisions. The “Adam Smith” Division is restricted to students enrolled in any two semester econ macro and micro course sequence or any course labeled as AP, IB, honors, or differentiated. Additionally, if you previously participated in the David Ricardo Division, you must register for Adam Smith in this year’s competition. The “David Ricardo” Division is restricted to students enrolled in one-semester or less high school course not labeled as AP, IB, honors, differentiated, or college level. You must registration for the EconChallenge ONLINE! by March 24, 2019. Once registered, teachers will be able to create their student teams. More information can be found on the CEE Webiste.